Most of the editions of the first Critique give the A/B numbers for the text, which is very useful. But some editions, especially the online edition of the Akademie edition of Kant use the Akademie page numbers. This becomes incredibly annoying when I want to flip between these. Mostly this comes up for me when I am searching for a word on the online edition, and the online edition shows where the word shows up in the Akademie edition, but there is no indication where this word occurs in, say, the Guyer translation. Every other standard translation of a Kant text does include the Akademie page numbering, but for some reason, First Critique editions don't. If I could find a translation of the First Critique that had both A/B numbers and Akademie numbers, this problem would be solved. Does anyone know of such an edition? Alternatively, if anyone knows a way to search Kant's German text, besides the Korpora online, that might help too. For full-text search, there is no alternative to korpora known to me. If you have electronic copies of the texts (e.g. like the Cambridge Editions), you can use programs like DocFetcher to search across documents. But you asked for a German one. As of English editions, there is also no edition known to me that fits your needs. This has historical reasons since the Critique of Pure Reason traditionally is cited per A/B edition. Ironically, the only edition that allows for a transition between both paginations is the physical reprint of the original Akademie-Edition by deGruyter (or earlier (re-)prints, but they are hard to get). 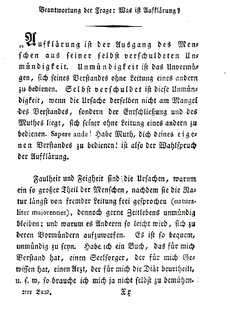 In volume III (B-Edition) and IV (A-Edition until identical), there are B and A edition page numbers respectively at the side of the text which is obviously in the Akademie pagination. These additional page numbers did not make it into the online version, which is a pity. Caveat: The font is the old German type (it is a photocopy of the original Akademie Edition from around 1900), see image below (not from either texts, but a later volume, hence no page numbers at the side of the text - it is only to show the type). I got accustomed to reading this type fluently in a short time but heard that people tend to have problems with it, especially without former experience.